CASSETTE BODY SHIMANO 9S, X4 COMPATIBILITY TYPE, 3x2 PAWLS, FOR 42 TEETH RATCHET RING, ANTI BITE GUARD FEATURE (A.B.G. 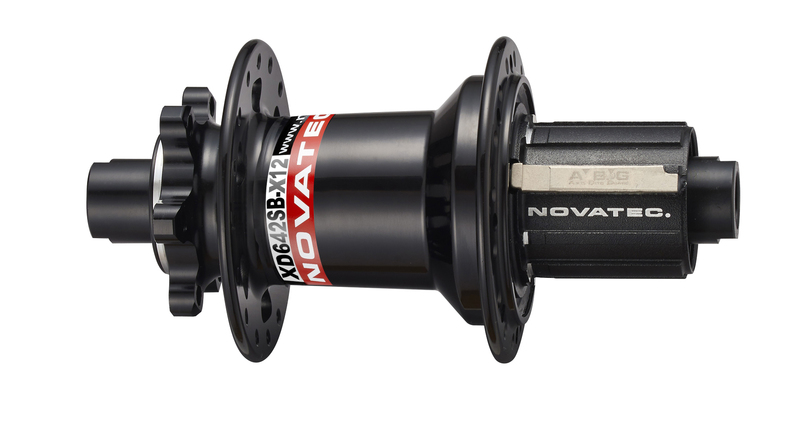 ), ALLOY MATERIAL, FOR NOVATEC MTB WHEELS (HUB XD642SB). CASSETTE BODY SRAM XD, X4 COMPATIBILITY TYPE, 3x2 PAWLS, FOR 42 TEETH RATCHET RING, ALLOY MATERIAL, FOR NOVATEC MTB WHEELS (HUB XD642SB). SIDE CAPS - 12MM, ALLOY, REAR, LEFT/RIGHT, MULTI-AXLE SYSTEM, ASSEMBLED (INCL.PARTS+WASHERS+O-RINGS), FOR HUB XD642SB, FOR NOVATEC MTB WHEELS. SIDE CAPS - 10MM, ALLOY, REAR, LEFT/RIGHT, MULTI-AXLE SYSTEM, ASSEMBLED (INCL.PARTS+WASHERS+O-RINGS), FOR HUB XD642SB, FOR NOVATEC MTB WHEELS. SEALED BEARING #6903, SIZE: 30 x 17 x 7 MM, WEIGHT: 35.7 G.
RATCHET RINGS, 42 TEETH, PRESS-IN AND THREADED TYPE, MATERIAL: STEEL, FOR HUB XD642SB USED ON NOVATEC MTB WHEELS (X4 SYSTEM) AND FOR HUB D542SB, DH42SB (XS SYSTEM - SYNERGY CANTILEVER). THREADED TYPE WAS DISCONTINUED THREFORE RECENT HUBS ARE USING ONLY PRESS-IN TYPE OF RATCHET RING. SPECIAL TOOL IS NEEDED TO REMOVE / INSTALL RATCHET RINGS.